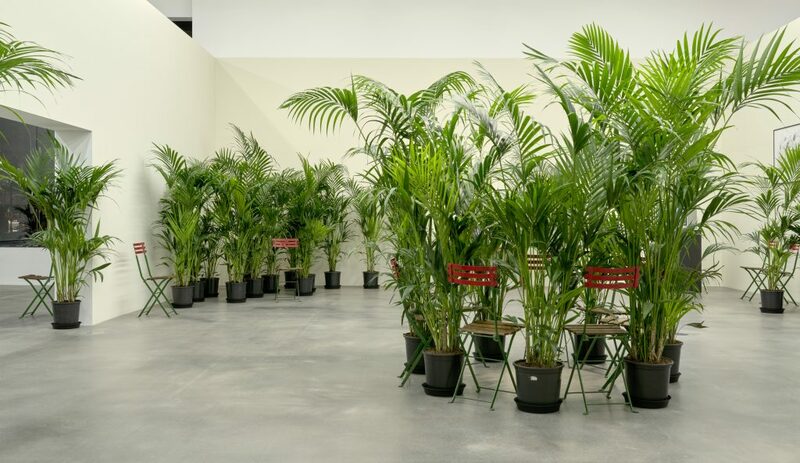 Hauser & Wirth presents Marcel Broodthaers’ ‘Un Jardin d’Hiver’ (A Winter Garden) (1974), a seminal installation belonging to the artist’s Décors series created in the last years of his life. The gallery first staged ‘Un Jardin d’Hiver’ in Zurich in 1998 and this exhibition will once again pay tribute to this artist. 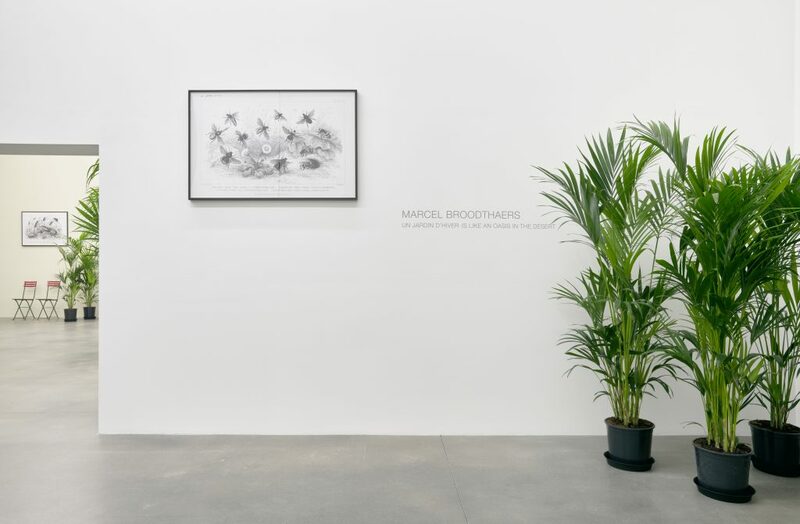 A major contributor to the inception of conceptual art as a genre, Broodthaers holds a significant place in the historical narrative of contemporary art. His practice was largely concerned with two issues: the status of art as a commodity, and the impact of the museum on discourses surrounding artistic practice as well as on their reception. ‘Un Jardin d’Hiver’ is a subtle indictment of the authority of cultural institutions. In this work Broodthaers draws a link between Europe’s imperial history and the cultural hierarchies dictated by museums and galleries, thereby framing art as a sphere susceptible to colonisation. 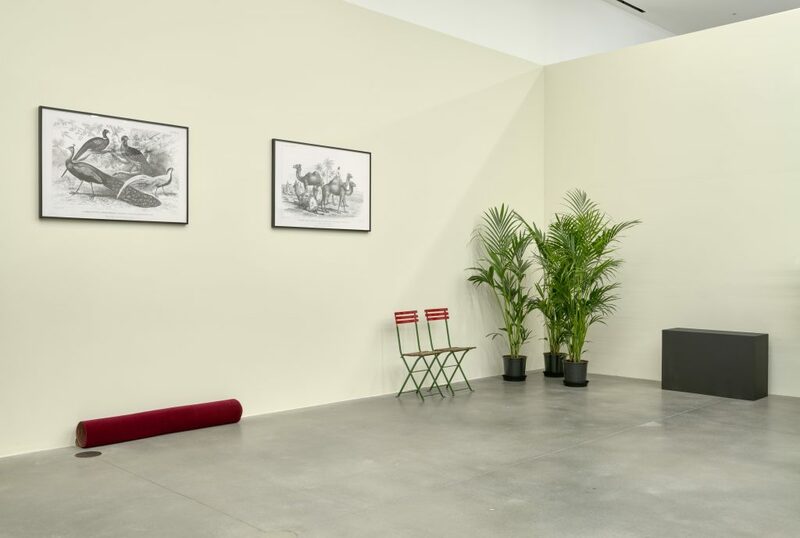 For the Décors series, Broodthaers inhabited the role of sceneographer, creating disquieting theatrical compositions using domestic objects. 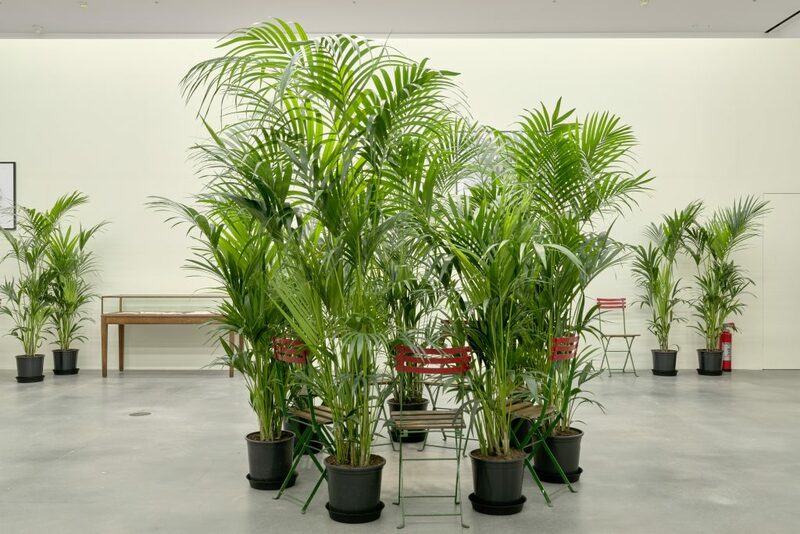 ‘Un Jardin d’Hiver’ parodies a traditional museum or gallery space modelled on the late 19th-century palm court, once popular in wealthy European homes. A descendent of the Wunderkammer, the palm court marked the transition of private collection to public museum. 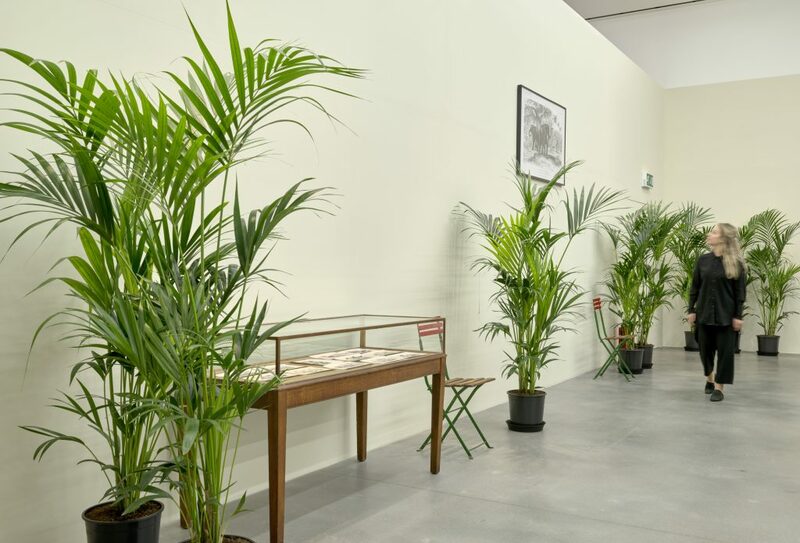 Broodthaers’ assembly of potted palms, framed images of different categories of animals (elephants, camels, insects, exotic birds), and antique display cases clearly tie the installation to that period of colonial conquest, characterised by a passion for collecting and classifying unusual objects from around the world. 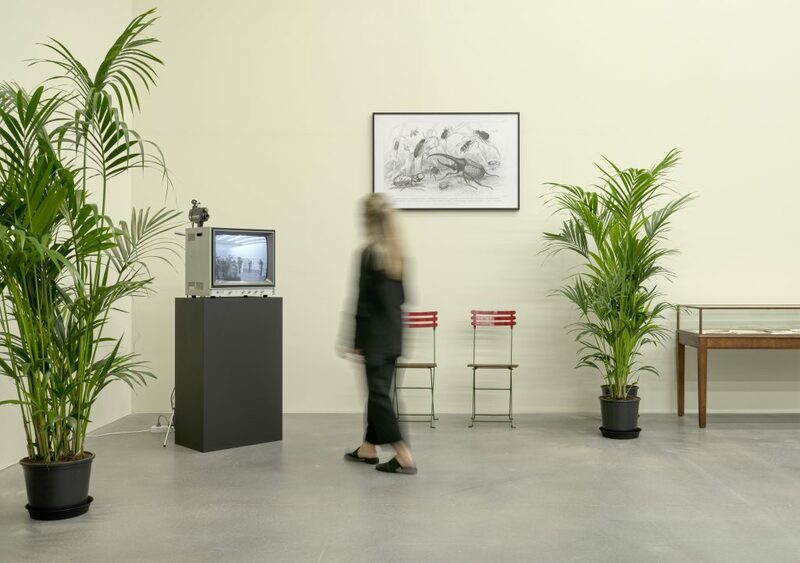 Yet, the room also evokes a tired, modern museum space – in one corner a television monitor displays a closed circuit film recorded by a surveillance camera. 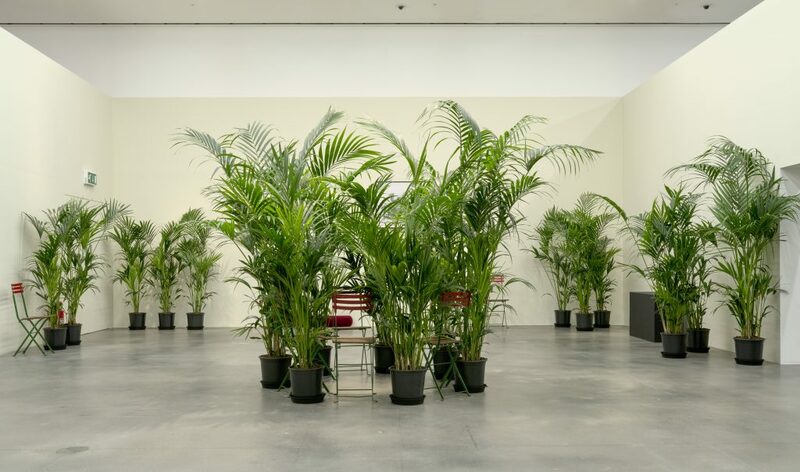 Installed amongst the plants and a few rows of chairs, the monitor mimics the coupling of decorative decoy and surveillance that so often marks banal spaces that hover between public and private, such as waiting rooms, offices or lobbies. The potted palm, once an exotic symbol of power, by the mid-1970s had become the most commonly available type of decoration used everywhere from banks to cafes. In another corner, a neglected red carpet hints nostalgically at former glory and ceremony. The museum pastiche that Broodthaers creates is rich in historical connotation, evoking the evolution of the art institute model and shifts in accepted modes of display. He reminds the viewer that the origin of the museum is inextricably linked to Europe’s colonial past; taste, culture and value are inherently dictated by socio-economic forces. This line of thinking explains the artist’s wider rejection of the creative trends at the time – for Broodthaers, the once-radical premise of Duchamp’s readymade, for example, had ossified into a new institutionalism. 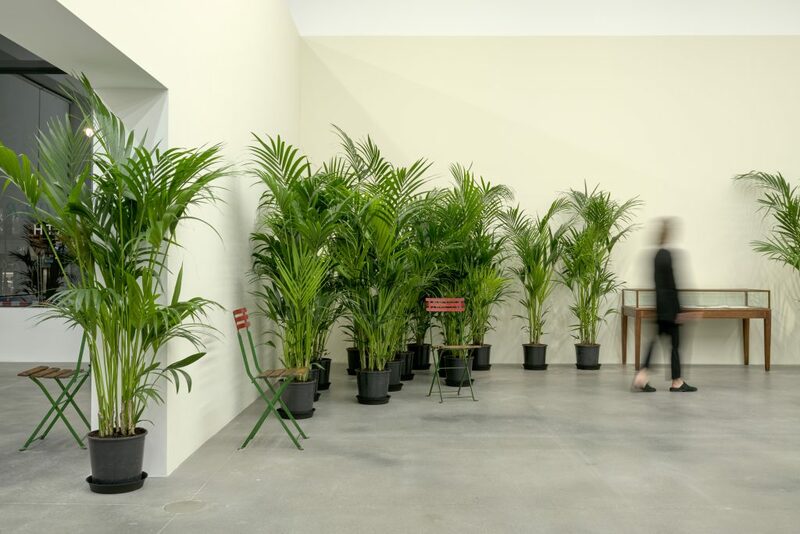 In the period that Broodthaers was making the Décors, he was one of many artists experimenting with what is now constituted site-specific art. When ‘Un Jardin D’Hiver’ was unveiled in 1974, the adjoining rooms featured in-situ works by Carl Andre, Daniel Buren and Richard Long. 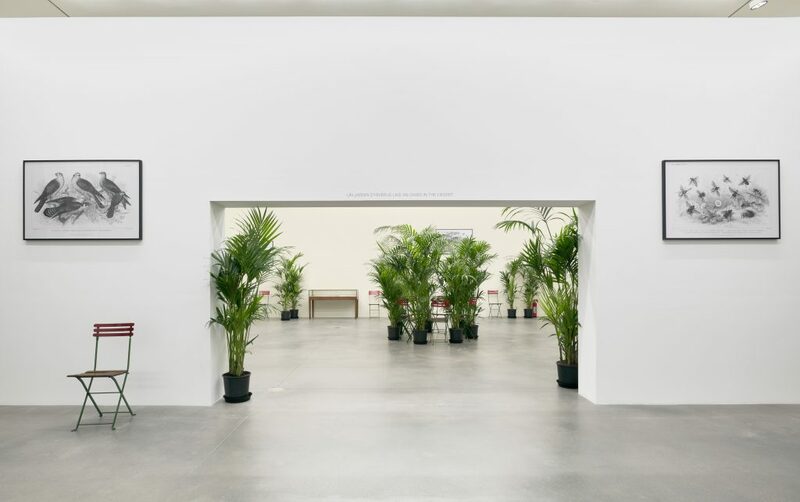 Broodthaers’ highly ornamental Winter Garden was at odds with the Minimalism and Conceptualism that dominated the show; their spare, clean, often industrial work represented the contemporary international standard of how art should look. The turn-of-the-century design follies of ‘Un Jardin D’Hiver’ find a curious echo in the ‘site-specificity’ of such art in the 1970s. Broodthaers was alluding to the idea that avant-garde conceptualism had, just like the exotic objet d’art and the readymade that came before, been colonised by a the museum.